As you know from reading MyMac.com, there are a ton of iPod cases out there. In order to get anywhere in this market you need to make something different. iFrogz has done just that with there customizable iPod cases. 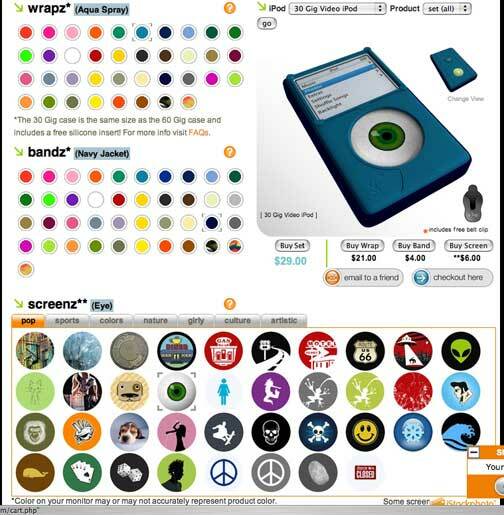 The iFrogz cases are available for the iPod Nano (both generations), 20/40GB iPods, the 30GB iPod w/Video, the 60/80GB iPods with Video, and the iPod mini. I was able to test the Nano and 30GB models, so those are what I will be focussing on. The iFrogz cases are made up of three parts. First there is the Wrapz. The Wrapz is the main silicone case that covers most of your iPod. There is an opening for the click wheel, the screen, the dock connector, the hold button, and headphones. Second, you have the Bandz. The Bandz is like the silicone bracelets (i.e.. LiveStrong) that have become so popular. 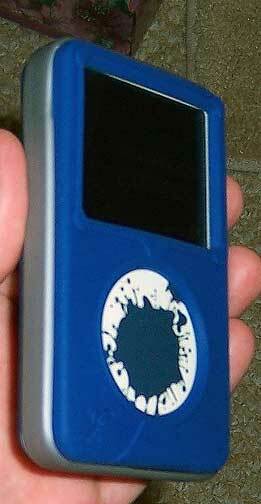 The Bandz goes around the edges of the iPod, over the Wrapz. This covers and protects the dock connector opening, and also the hold button. It does have an opening for headphones. The Bandz also serves to tighten the Wrapz around your iPod. Both the Wrapz and the Bandz are available in your choose of color, which you choose through the order process. Some of the colors vary by iPod model, but there is a huge assortment of color choices, which results in an even bigger amount of color combinations. Finally, there is the Screenz. Screenz are where you really get to personalize your iPod. A Screenz is made up of a nice plastic screen overlay for the front of the iPod. This overlay is similar to other plastic shields I have tried. It has a sticky surface that will not leave residue on the iPod, and it basically protects your screen and iPod from scratches. The second part of the screen is a click wheel sticker that can come in a variety of options. There are paint splats, sports balls, flowers, aliens, and more. 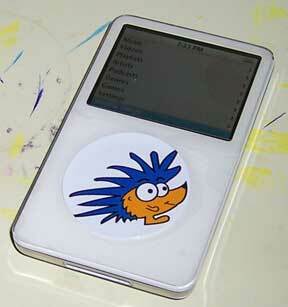 This click wheel sticker goes on top of the overlay, and covers the click wheel of the iPod. Even with the two layers of protection, the click wheel still works fine. Ordering an iFrogz case is a lot of fun, but it can take forever (not a bad thing). You choose you iPod model, and then you are presented with the options screen. Here you choose the colors of your Wrapz and Bandz, and you choose you Screenz sticker. 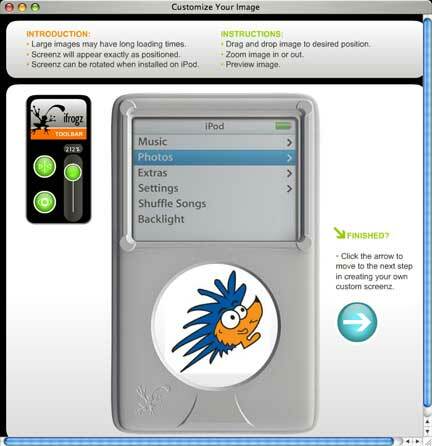 As you choose an option, it appears on the iPod mockup. On a side note- I did find that the ordering portion of the site did not work in the Camino browser. I had to use Safari. Color accuracy depends on your monitor. The two cases I tried were lighter than what showed up on my screen. I would say the colors were 95% accurate in my case. You can order the entire system or just order parts of the system. You could even order one system and then more Bandz and Wrapz to swap between. There are enough choices to have a different case for every day of the year! Fun factor and looks of a case mean nothing if it does not protect the iPod. The iFrogz cases are some of the thickest silicone cases I have seen. With the double layered system of the Wrapz and the Bandz I am fairly confident in the protection the iPod would get in a soft fall or bump. I would definitely trust my iPod to the iFrogz case. As I mentioned earlier, the Screenz is a thin plastic overlay that will protect the iPod from scratches. It does not totally surround the iPod, but that is fine since you have the protection of the Wrapz. However, I would like to see some type of hard plastic screen protector. One of the things I don’t like about the silicone cases I have tried before is that they are so hard to get the iPod into. This is not the case with the iFrogz. I was able to slide the iPod in and out of the case with ease. I would imagine this is due to the fact that the case is a little loser, relying on the Bandz to tighten the fit. The 30gb case is basically a 60GB case with a gel insert. I did have a problem with the headphone opening on the Bandz. The opening is made to fit the connector of Apple’s included headphones. I don’t like earbuds, so I use headphones by another company. The connector on my headphones would not fit through the opening of the Bandz. It fits through the Wrapz opening, so I would have to remove a corner of the Bandz to use my headphones. Each iFrogz case comes with a bunch of stuff and in a great plastic bag. The bag itself is something I would keep my iPod in when traveling or sitting on a beach or at the pool for an extra layer of protection. In the bag you get the Bandz and the Wrapz. Then you get the Screenz with three click wheel stickers in both the Nano size and the full size. 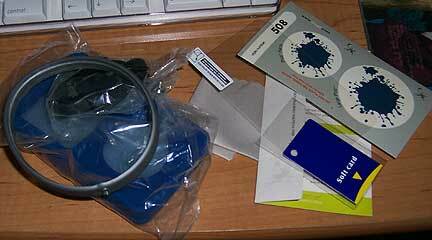 There is also a hard card for getting bubbles out of the Screenz, and a wipe to clean the iPod. The wipe is a nice fabric wipe that people who where glasses might be familiar with. You can purchase them in eyeglass stores for a couple of dollars. The 30gb case comes with a belt clip. The belt clip is a nice quality belt clip, which attaches to the case by a thick screw pin. I have some concerns about the belt clip. The weight of the iPod is too much for the clip. This is difficult to describe, but the iPod case dangles from the clip, instead of hugging it like other clips do. The Nano case does not come with a belt clip. Instead, it has a lanyard. I am not a fan of lanyards, and the lightness of the Nano seems like it would work perfectly with the iFrogz belt clip. Also, the case has two holes for the lanyard, but the lanyard on has one small loop. Having the ability to connect to both holes seems like it would provide a much better experience balancing the Nano when wearing the lanyard around your neck. If the customizable options I’ve mentioned so far aren’t enough, there is more. For $19.99 (currently on sale for $14.99 at the time of this writing), you can order a custom Screenz with your own image on the clickwheel cover. The process is simple. You upload the image you want to use, following the specifications on the site. The image will than be shown on an iPod. You can rotate, and resize the image to fit right on the site. The print quality of the image is fantastic. The color is true to the original, and the quality is as good as the standard images. I did find that you should size the image smaller than it fits on the template. I sized mine with a little white edge around the click wheel. It printed a little bigger than I thought it would based on the template. As with the cases, the Screenz give you a lot for your money. You get three sets of Screenz with your order. Each set is a Nano and full size sticker, a plastic iPod overlay, the card for air bubbles, and the cloth. Also, the packaging is great. This would be a great gift for someone or a party favor. I can see click wheel covers with grandchildren on them or company logos. Overall, the iFrogz cases are nice cases. For $29.99 you get a nice case and a great way to personalize your iPod, and the custom Screenz allow for even more customization. Ifrogz has definitely found a way to stand out in a crowded market. With a money back guarantee, I definitely suggest trying one out. Ifrogz iPod Case for the iPod Nano: 4 out of 5.